Metering rods are precision instruments used to accurately meter the amount of liquid coating applied to papers, films, foils, and other substrates. Customarily, excess coating (referred to as the pre-coat flood) is applied to the substrate prior to making contact with the metering rod. The metering rod removes excess coating, leaving a precisely metered layer on the substrate. Metering rods are used in Rod Metering Size Presses to surface size both the front and back of the paper. The rod accurately controls the volume of starch and/or other coatings. In these applications, the sizing agent is metered onto a transfer roller which transfers the coating to the moving paper web. Smoothing rods are used to apply Kaolin clay coating to both single and duplex coated board. Linerboard plants use metering rods to apply a variety of color and functional coatings to liner and medium. Examples include the application of white coating prior to a printing operation and barrier coatings that keep grease and moisture from penetrating the sheet. Metering rods are used in converting coating operations for a vast array of purposes, such as applying adhesive to tape, silicone release, or laying down tint on window film treatments. The first metering rods, originally called “equalizer bars” or “doctor bars,” were introduced in the early 1900s by Charles W. Mayer. This is why metering rods are sometimes referred to as Mayer rods. Other terms for metering rods include metering bars, “meyer” rods, mayer bars, mayer coating rods, coating rods, smoothing rods, sizer bars, and whole host of other variations. The first metering rods consisted of a round steel rod tightly wrapped with wire. The area created by the valleys between wires determines the amount of coating that is metered. A typical wire-wound metering rod is shown in Figure 1. By changing the diameter of the wire used to wrap the rod, coating application volume can be easily changed and accurately controlled; the larger the wire, the larger area between wires, which allows more coating to pass through the windings and stay on the substrate. The ease with which coating weights can be quickly and accurately changed simply by using a different size wire is one of the main reasons metering rods remain a popular method to meter coatings over 100 years after their introduction. In the early 1980s, Thomas Buschman revolutionized the metering rod industry by introducing precision rollformed (sometimes called grooved) metering rods. 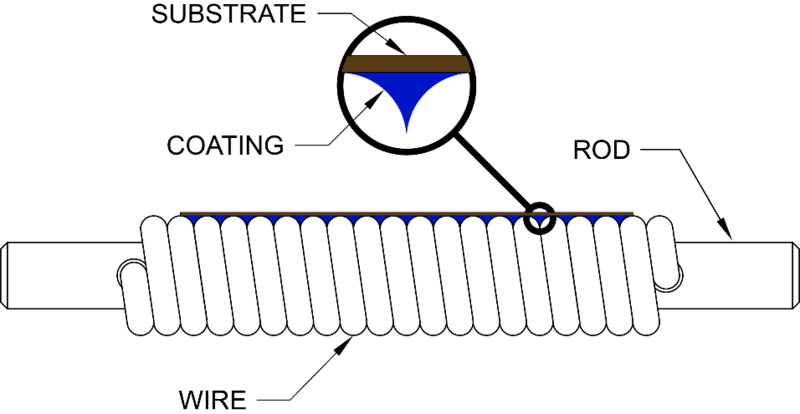 Instead of wire wrapped around the rod, a precision thread is cold formed into the surface of the metering rod as shown in Figure 2. Like wire rods, application volume is controlled by the area of the valleys between thread peaks. Unlike wire, the shape of the thread profile can be engineered and manipulated to control rod performance variables. While wire-wound rods are still in use today, grooved metering rods offer many advantages over their wire-wound cousins. Since we introduced roll-formed metering rods in the 1980s, Buschman has continuously worked to improve this technology and leads the world in customized thread profiles. Today we have over 25 different thread shapes and often custom engineer new profiles to meet demanding applications. Contact us today to learn how Buschman metering rods can optimize your coating application.